e-book download as well as a soft cover book for your library. The option is up to you. Click the button below to be redirected to our ordering page. The entertainers complete guide to working the festival market. ever ask for in regards to working not only festivals, but also how to work any festival or fair event. This is one of the ONLY books that is devoted solely to giving YOU the information you need to work a market that can generate substantial income for you year round. even a strolling magician, then festivals are a perfect extension of what you are already doing. You can learn to work them well with simply modifying your current show and having an understanding of how to market effectively to them. This is what Kyle gives to you and SO much more. spent years compiling the information contained within the 110+ pages of this book. And much, much more inside. Take your magic to a new level by learning the tips and techniques to work the festival market and to really excel at it by giving the festivals a perfect solution they are looking for. This book tells you how. If you want to learn all there is to know about festivals and how to work them year round, then this book is simply a MUST! "I put this right up there with Nick Lewin's Cruise ship book. It takes Pro's to write these time saving informative books to help shorten the learning curve and get you out there working. A must buy not just for magicians but for any variety act looking for this type of work!" "A thorough treatise on the ins-and-outs of performing in a lucrative market, written by someone that has obviously "been there, done that" and is willing to share his years of experience. No question - everything you need to know about breaking into and being successful in the festival market is covered in detail in the pages of this book. In a word... excellent!" “Kyle Peron does NOTHING half way. 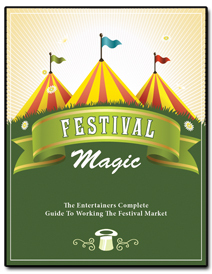 His newest book on working festivals and fairs is comprehensive and in-depth. That being said, his easy-to-read style helps you breeze right through and comprehend this great info. If I were going to work in this market, Kyle's book is where I'd start. However, much of this information will benefit those working in even other markets." “Kyle has written another amazing book about a market that he knows a lot about. If you have every wanted to get into the festival market, this book is a MUST have. Kyle leaves nothing out and gives you every detail you will need to get into a fun market."